As Memorial Day kicks off Summer 2000, what a great way to celebrate the outdoors for this holiday, with barbecues, and most especially, music. Country music. Alabama music. 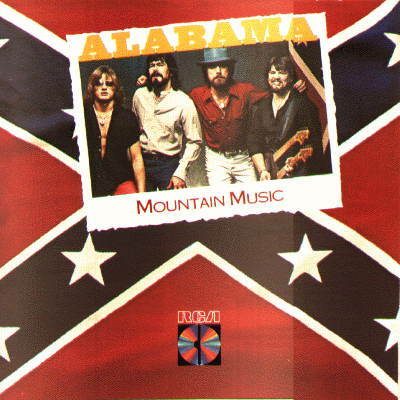 Alabama -- Mountain Music. If you're a common fan of country music, there's no doubt that the title track should be no stranger. It's one of the best well-known Alabama songs, and quite frankly, it defines true country, where today's country is more pop. The title track reached Number 1 on the country chart. Likewise, two other songs on this album also reached Number 1: "Close Enough To Perfect, " and "Take Me Down." "Words At Twenty Paces" is a bit moody; not the normal honky-tonkin' country sound. Yet this song is country, it's another great album track. "Changes Comin' On" is your typical country ballad, with a medium uptempo beat. "You Turn Me On" and "Never Be One" are slow ballads in country sound fashion. "Lovin' You Is Killin' Me" has a more pop/rock sound, yet, like the whole album, it's country. The album's closer, "Gonna Have A Party" returns the common Alabama country sound. Yet the 1980s country is somewhat different in sound as the late-1990s and today's country, Mountain Music defines Alabama as a true country band. It's country, it's pop, it's Alabama. Their music no doubt should always bring a smile to everyone's face. Mountain Music, like any other Alabama original album, is definitely entertaining, country style. © WSVNRadio.net. All rights reserved. Review or any portion may not be reproduced without written permission. Cover art is the intellectual property of RCA Records and is used for reference purposes only.